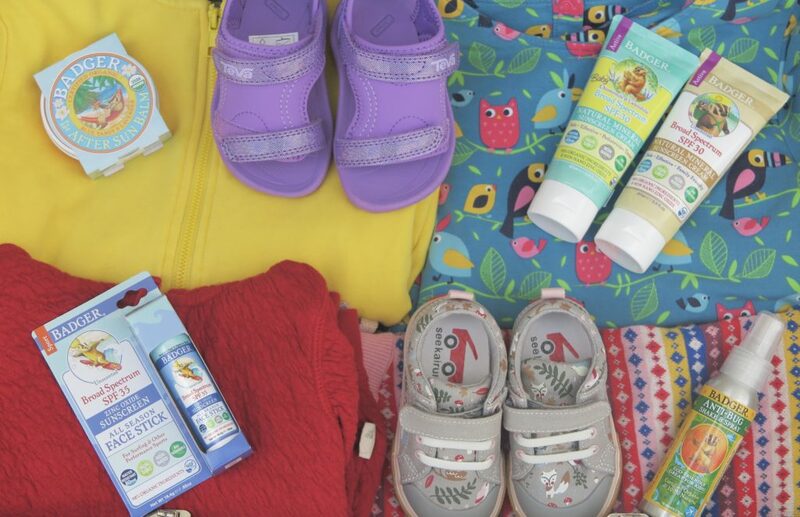 Mama’s Summer Essentials Packing List! Summer is finally in full swing, which means many of you are on your way to visit friends and family, go camping, visit our fabulous New York state parks and – if you’re lucky – getting some beach time! What do you need for your trip? We looked around the sales floor and gathered a sampling of some of our favorite items for fun in the sun. What’s on your essential packing list? Books? Toys? Sun hats? Yep – we got ’em! Comfortable Sandals: Functional and fun Teva sandals will keep your gosling cool while providing all the support and stability little feet need. Plus, all Teva sandals are currently 15% off at Mama Goose! Sunscreen and After-sun Care: We carry Badger products in the summer because we love the wide range of sun protection products for all levels of activity. And for the times when you miss a spot, Badger After Sun Balm will help to soothe your little one’s skin with certified natural ingredients. A thin, soft hoodie: If you carry a nice, soft gently-used hoodie in your kids’ sizes, you’re golden! Perfect for cloudy days that turn into cool nights, the ability to zip up or down and the comfort of a hood make this the perfect piece for road trips. Easy-on Sneakers: See Kai Run sneakers are perfect for running around your favorite amusement park or a slow stroll through a museum. The rugged rubber outsole provides traction and durability – great for developing feet. Comfy, stretchy pants: Easy to toss in a bag, a pair or leggings or sweats are ideal for temperature changes and relaxed car rides. Layer them for warmth, or fashion – whatever is on your little one’s agenda. Bug Spray: Let’s face it – bugs are everywhere in the warmer months. Badger’s Anti-Bug Shake & Spray uses all natural ingredients to repel pests without harsh smells or chemicals. It’s good for the skin, and bad for the bug. Happy summer, Mamas! Let us help with your last minute vacation must-haves, so you can focus on the fun! Looking for something fun to do a little closer to home? Check out Ithaca Family Fun for some great tips on happenings right here in our back yard!